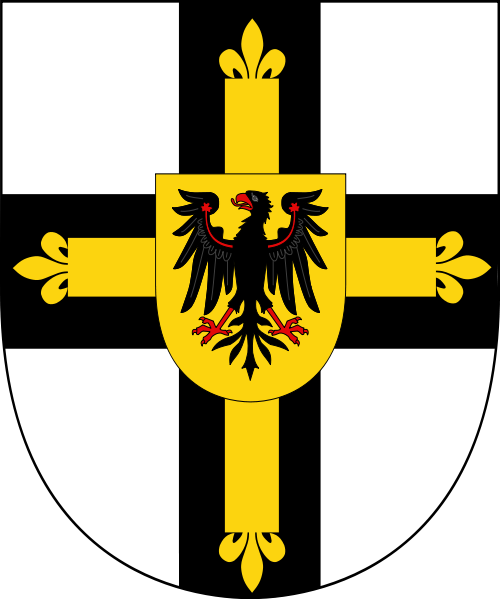 (official names: Latin: Ordo domus Sanctæ Mariæ Theutonicorum Hierosolymitanorum, German: Orden der Brüder vom Deutschen Haus der Heiligen Maria in Jerusalem), commonly the Teutonic Order (Deutscher Orden, Deutschherrenorden or Deutschritterorden), is a Catholic religious order founded as a military order c. 1190 in Acre, Kingdom of Jerusalem. The Teutonic Order was formed to aid Christians on their pilgrimages to the Holy Land and to establish hospitals. Its members have commonly been known as the Teutonic Knights, having a small voluntary and mercenary military membership, serving as a crusading military order for protection of Christians in the Holy Land and the Baltics during the Middle Ages. 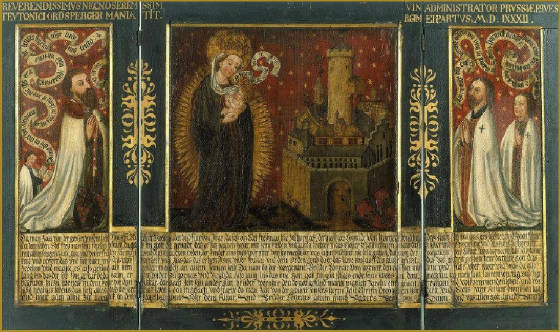 The full name of the Order in German is Orden der Brüder vom Deutschen Haus St. Mariens in Jerusalem or in Latin Ordo domus Sanctæ Mariæ Theutonicorum Hierosolymitanorum (engl. "Order of the House of St. Mary of the Germans in Jerusalem"). Thus, the term 'Teutonic' refers to the German origins of the order in Latin. It is commonly known in German as the Deutscher Orden (official short name, literally "German Order"), historically also as Deutscher Ritterorden ("German Order of Knights"), Deutschherrenorden, Deutschritterorden ("Order of the German Knights"), Marienritter ("Knights of Mary"), Die Herren im weißen Mantel ("The lords in white capes"), etc. 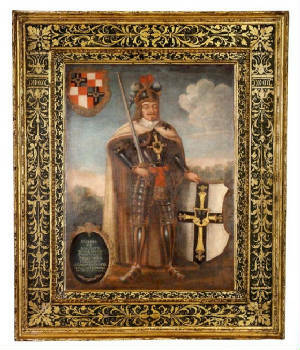 The Teutonic Knights have been known as Zakon Krzyżacki in Polish ("Order of the Cross") and as Kryžiuočių Ordinas in Lithuanian, Vācu Ordenis in Latvian, Saksa Ordu or, simply, Ordu ("The Order") in Estonian, as well as various names in other languages. Knighthood was associated to feudalism and service. The knight was always required to help the sick and wounded after a battle and was regarded to be brave, honest and determined. 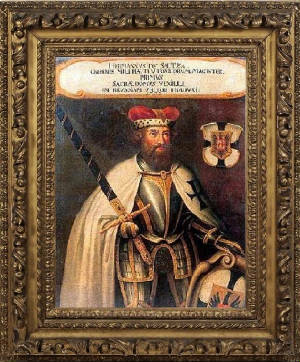 In 1515, Holy Roman Emperor Maximilian I made a marriage alliance with Sigismund I of Poland-Lithuania. Thereafter, the empire did not support the Order against Poland. In 1525, Grand Master Albert of Brandenburg resigned and converted to Lutheranism, becoming Duke of Prussia as a vassal of Poland. Soon after, the Order lost Livonia and its holdings in the Protestant areas of Germany. The Order did keep its considerable holdings in Catholic areas of Germany until 1809, when Napoleon Bonaparte ordered its dissolution and the Order lost its last secular holdings. However, the Order continued to exist as a charitable and ceremonial body. It was outlawed by Adolf Hitler in 1938, but re-established in 1945. Today it operates primarily with charitable aims in Central Europe. 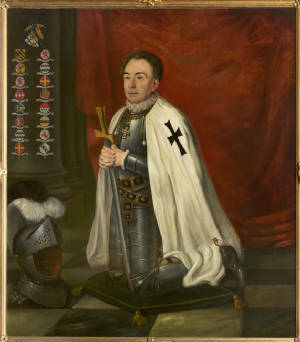 The Knights wore white surcoats with a black cross. 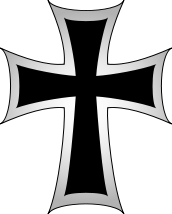 A cross pattée was sometimes used as their coat of arms; this image was later used for military decoration and insignia by the Kingdom of Prussia and Germany as the Iron Cross and Pour le Mérite. 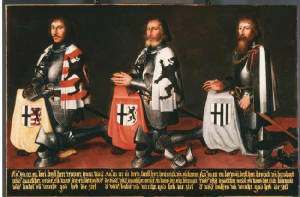 The motto of the Order was: "Helfen, Wehren, Heilen" ("Help, Defend, Heal"). In 1226, Konrad I, Duke of Masovia in north-eastern Poland, appealed to the Knights to defend his borders and subdue the pagan Baltic Prussians, allowing the Teutonic Knights use of Chełmno Land (Culmerland) as a base for their campaign. 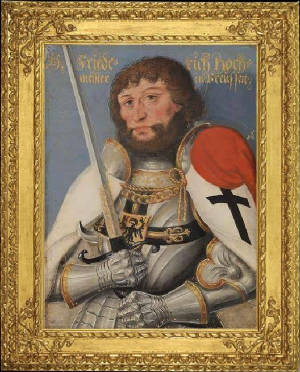 This being a time of widespread crusading fervor throughout Western Europe, Hermann von Salza considered Prussia a good training ground for his knights for the wars against the Muslims in Outremer. With the Golden Bull of Rimini, Emperor Frederick II bestowed on the Order a special imperial privilege for the conquest and possession of Prussia, including Chełmno Land, with nominal papal sovereignty. 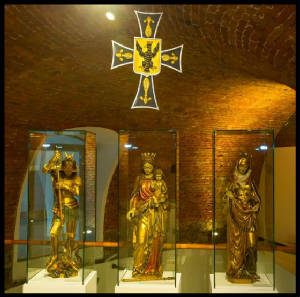 In 1235 the Teutonic Knights assimilated the smaller Order of Dobrzyń, which had been established earlier by Christian, the first Bishop of Prussia. 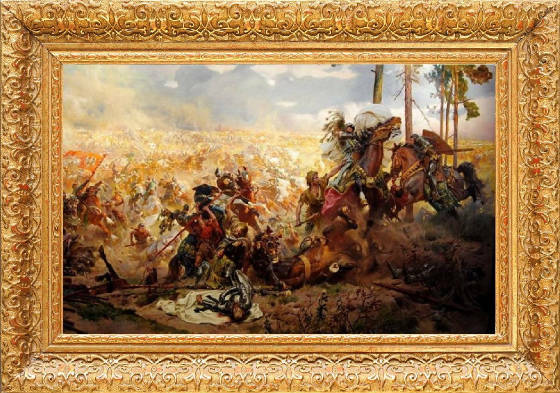 Conquest of Prussia was accomplished with much bloodshed over more than fifty years, during which native Prussians who remained unbaptised were subjugated, killed, or exiled. Fighting between the Knights and the Prussians was ferocious; chronicles of the Order state the Prussians would "roast captured brethren alive in their armour, like chestnuts, before the shrine of a local god". The Order ruled Prussia under charters issued by the Pope and the Holy Roman Emperor as a sovereign monastic state, comparable to the arrangement of the Knights Hospitallers in Rhodes and later in Malta. To make up for losses from the plague and to replace the partially exterminated native population, the Order encouraged immigration from the Holy Roman Empire (mostly Germans, Flemish, and Dutch) and from Masovia (Poles), the later Masurians. These included nobles, burghers, and peasants, and the surviving Old Prussians were gradually assimilated through Germanization. The settlers founded numerous towns and cities on former Prussian settlements. The Order itself built a number of castles (Ordensburgen) from which it could defeat uprisings of Old Prussians, as well as continue its attacks on the Grand Duchy of Lithuania and the Kingdom of Poland, with which the Order was often at war during the 14th and 15th centuries. Major towns founded by the Order included Allenstein (Olsztyn), Elbing (Elbląg), Klaipėda (Memel), and Königsberg, founded in 1255 in honor of King Otakar II of Bohemia on the site of a destroyed Prussian settlement. Warfare between the Order and the Lithuanians was especially brutal. It was common practice for Lithuanians to torture captured enemies and civilians, it is recorded by a Teutonic chronicler that they had the habit of tying captured Knights to their horses and having both of them burned alive, while sometimes a stake would be driven into their bodies, or the Knight would be flayed. Lithuanian pagan customs included ritualistic human sacrifice, the hanging of widows, and the burying of a warrior's horses and servants with him after his death. The Knights would also, on occasion, take captives from defeated Lithuanians, whose condition (as that of other war captives in the Middle Ages) was extensively researched by Jacques Heers. The conflict had much influence in the political situation of the region, and was the source of many rivalries between Lithuanians or Poles and Germans, the degree to which it impacted the mentalities of the time can be seen in the lyrical works of men such as the contemporary Austrian poet Peter Suchenwirt. The conflict in its entirety lasted over 200 years (although with varying degrees of aggression during that time), with its front line along both banks of the Neman River, with as many as twenty forts and castles between Seredžius and Jurbarkas alone. 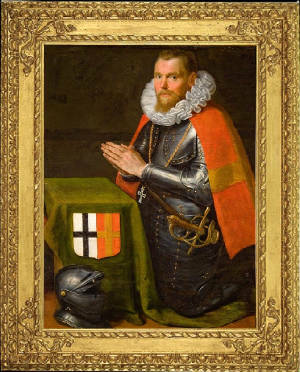 The capture of Danzig marked a new phase in the history of the Teutonic Knights. The persecution and abolition of the powerful Knights Templar, which began in 1307, worried the Teutonic Knights, but control of Pomerelia allowed them to move their headquarters in 1309 from Venice to Marienburg (Malbork) on the Nogat River, outside the reach of secular powers. 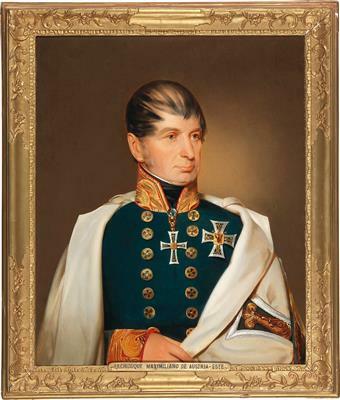 The position of Prussian Landmeister was merged with that of the Grand Master. The Pope began investigating misconduct by the knights, but no charges were found to have substance. Along with the campaigns against the Lithuanians, the knights faced a vengeful Poland and legal threats from the Papacy. The Treaty of Kalisz of 1343 ended open war between the Teutonic Knights and Poland. The Knights relinquished Kuyavia and Dobrzyń Land to Poland, but retained Culmerland and Pomerelia with Danzig. In 1337, Emperor Louis IV allegedly granted the Order the imperial privilege to conquer all Lithuania and Russia. 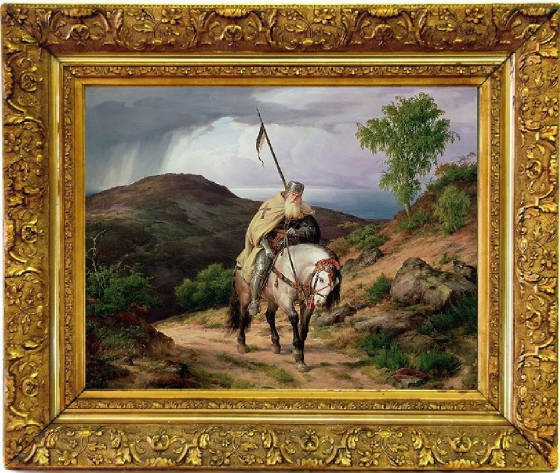 During the reign of Grand Master Winrich von Kniprode (1351–1382), the Order reached the peak of its international prestige and hosted numerous European crusaders and nobility. 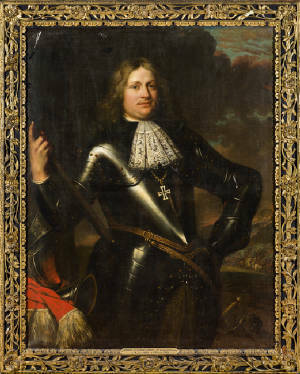 King Albert of Sweden ceded Gotland to the Order as a pledge (similar to a fiefdom), with the understanding that they would eliminate the pirating Victual Brothers from this strategic island base in the Baltic Sea. An invasion force under Grand Master Konrad von Jungingen conquered the island in 1398 and drove the Victual Brothers out of Gotland and the Baltic Sea. The baptism of Jogaila began the official conversion of Lithuania to Christianity. Although the crusading rationale for the Order's state ended when Prussia and Lithuania had become officially Christian, the Order's feuds and wars with Lithuania and Poland continued. The Lizard Union was created in 1397 by Prussian nobles in Culmerland to oppose the Order's policy. In 1407, the Teutonic Order reached its greatest territorial extent and included the lands of Prussia, Pomerelia, Samogitia, Courland, Livonia, Estonia, Gotland, Dagö, Ösel, and the Neumark, pawned by Brandenburg in 1402. The Order gradually lost control of these holdings until, by 1809, only the seat of the Grand Master at Mergentheim remained. Following the abdication of Albert of Brandenburg, Walter von Cronberg became Deutschmeister in 1527, and later Administrator of Prussia and Grand Master in 1530. Emperor Charles V combined the two positions in 1531, creating the title Hoch- und Deutschmeister, which also had the rank of Prince of the Empire. 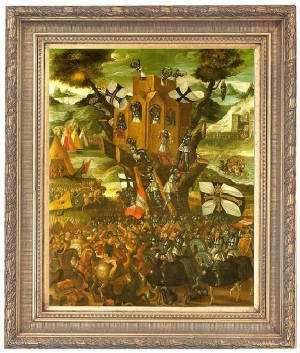 A new Grand Magistery was established in Mergentheim in Württemberg, which was attacked during the German Peasants' War. 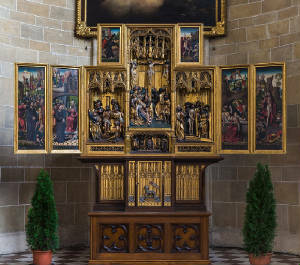 The Order also helped Charles V against the Schmalkaldic League. After the Peace of Augsburg in 1555, membership in the Order was open to Protestants, although the majority of brothers remained Catholic. The Teutonic Knights became tri-denominational, with Catholic, Lutheran and Reformed bailiwicks. The Grand Masters, often members of the great German families (and, after 1761, members of the House of Habsburg-Lorraine), continued to preside over the Order's considerable holdings in Germany. Teutonic Knights from Germany, Austria, and Bohemia were used as battlefield commanders leading mercenaries for the Habsburg Monarchy during the Ottoman wars in Europe. 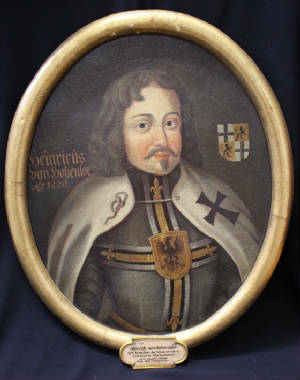 The military history of the Teutonic Knights was to be ended in 1805 by the Article XII of the Peace of Pressburg, which ordered the German territories of the Knights converted into a hereditary domain and gave the Austrian Emperor responsibility for placing a Habsburg prince on its throne. These terms had not been fulfilled by the time of the Treaty of Schönbrunn in 1809, and therefore Napoleon Bonaparte ordered the Knights' remaining territory to be disbursed to his German allies, which was completed in 1810. The Hochmeister (Grandmaster) was the highest officer of the order. Until 1525, he was elected by the Generalkapitel. He had the rank of an ecclesiastic imperial state leader and was sovereign prince of Prussia until 1466. Despite this high formal position, practically, he only was a kind of first among equals. The Roman Catholic order continued to exist in Austria, out of Napoleon's reach. From 1804 until 1923 (when Archduke Eugen of Austria resigned the grandmastership), the order was headed by members of the Habsburg dynasty. All the subsequent Grand Masters were priests. 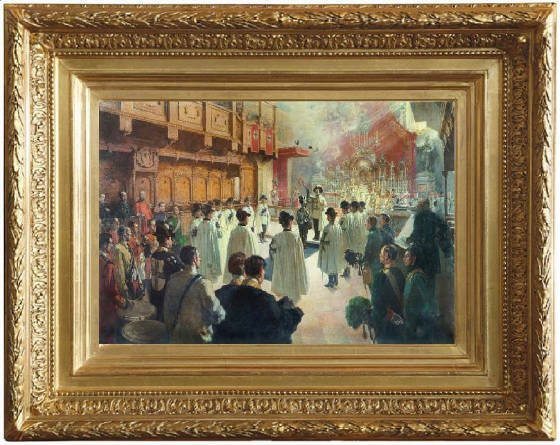 In 1929, that branch of the Teutonic knights was converted to a purely spiritual Roman Catholic religious order and renamed the Deutscher Orden ("German Order"). 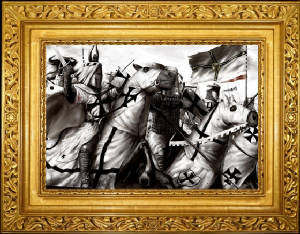 After Austria's annexation by Nazi Germany in 1938, the Teutonic Order was suppressed throughout the Großdeutsches Reich until defeat of that regime, although the Nazis used imagery of the medieval Teutonic knights for propagandistic purposes. 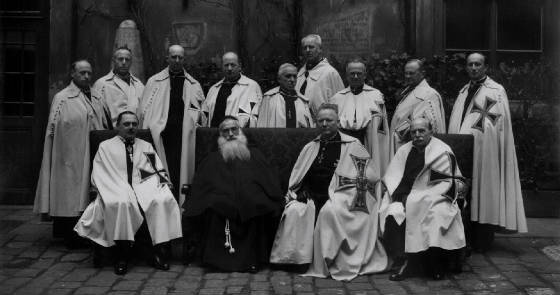 The Roman Catholic order survived in Italy, however, and was reconstituted in Germany and Austria in 1945. By the end of the 20th century, this part of the Order had developed into a charitable organization and established numerous clinics, as well as sponsoring excavation and tourism projects in Israel. 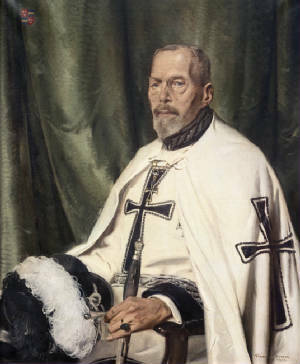 The Teutonic Order was formally revived back into a Chivalric Order of Knighthood, thus making a separate Chivalric Arm of the Teutonic Order from the present Clerical Arm of the Order in Vienna, By His Imperial and Royal Highness Prince Karl Friedrich of Germany, on Christmas Day in the year of Our Lord Two Thousand and One, by Imperial Decree. 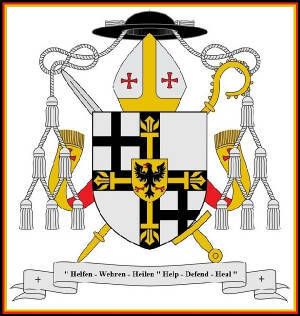 His Imperial Highness assumed the Grand Mastership of the Teutonic Order - Deutscher Orden, on the 1st day of Janaury, 2002, thus becoming the 60th Chivalric Hoch-und-Deutschmeister of the Teutonic Order of Saint Marys Hospital in Jerusalem - Deutscher Orden - German Order. The Clerical branch now consists of approximately 1,000 members, including 100 Roman Catholic priests, 200 nuns, and 700 associates. While the priests are organized into six provinces (Austria, the Czech Republic, Germany, Italy, Slovakia, and Slovenia) and predominantly provide spiritual guidance, the nuns primarily care for the ill and the aged. Associates are active in Austria, Belgium, the Czech Republic, Germany, and Italy. Many of the priests care for German-speaking communities outside of Germany and Austria, especially in Italy and Slovenia; in this sense the Teutonic Order has returned to its 12th-century roots: the spiritual and physical care of Germans in foreign lands. The current 8th Clerical Grand Master and General Abbot of the Order, who also holds the title of Hochmeister, is Frank Bayard since 2018. The current seat of the 8th Clerical Grand Master is the Deutschordenskirche ("Church of the German Order") in Vienna. Near the Stephansdom in the Austrian capital is the Treasury of the Teutonic Order, which is open to the public, and the Order's Central Archive. The current seat of the 60th Chivalric Grand Master of the Teutonic Order is the Castle in Bad Mergentheim in Germany, which has been the historical seat of the Hochmeisters of the Teutonic Order - German Order from the year 1525 and has again become the historical seat of the Teutonic Order - German Order since 2001 under the decree of the 60th Chivalric Hochmeister. 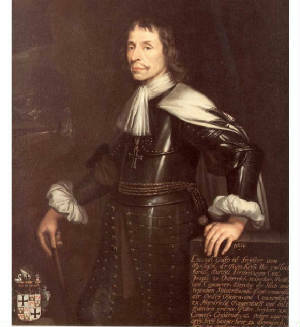 Honorary Knights of the Teutonic Order include Otto von Habsburg, Konrad Adenauer, and others. 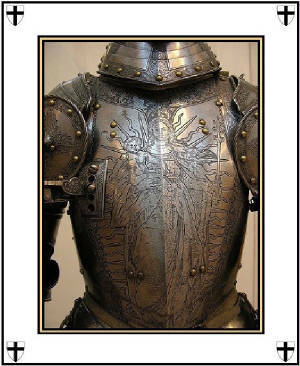 A portion of the Order retains more of the character of the knights during the height of its power and prestige. Der Balije van Utrecht ("Bailiwick of Utrecht") of the Ridderlijke Duitsche Orde ("Chivalric German [i.e., 'Teutonic'] Order") became Protestant at the Reformation, and it remained an aristocratic society. The relationship of the Bailiwick of Utrecht to the Roman Catholic Deutscher Orden resembles that of the Protestant Bailiwick of Brandenburg to the Roman Catholic Order of Malta: each is an authentic part of its original order, though differing from and smaller than the Chivalric and Clerical branchs of the Teutonic Order. 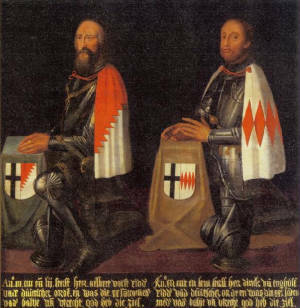 The Knights wore white surcoats with a black cross, granted by Innocent III in 1205. A cross pattée was sometimes used. 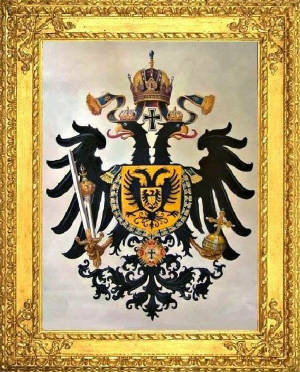 The coat of arms representing the grand master (Hochmeisterwappen) is shown with a golden cross fleury or cross potent superimposed on the black cross, with the imperial eagle as a central inescutcheon. The golden cross fleury overlaid on the black cross became widely used in the 15th century. A legendary account attributes its introduction to Louis IX of France, who is said to have granted the master of the order this cross as a variation of the Jerusalem cross, with the fleur-de-lis symbol attached to each arm, in 1250. While this legendary account cannot be traced back further than the early modern period (Christoph Hartknoch, 1684), there is some evidence that the design does indeed date to the mid 13th century. 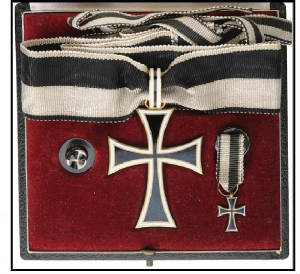 The black cross pattée was later used for military decoration and insignia by the Kingdom of Prussia and Germany as the Iron Cross and Pour le Mérite. 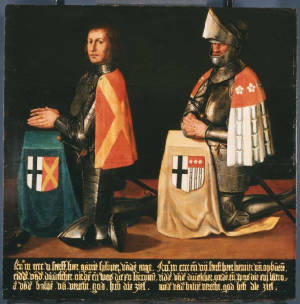 The motto of the Order is "Helfen, Wehren, Heilen" ("to help, to defend, to heal").